Phylogenetic analysis of the plastid (chloroplast) DNA matK gene of Zosteraceae species was undertaken. A molecular phylogenetic tree based on matK sequence data showed the monophyly of Heterozostera tasmanica and subgenus Zosterella and did not support the separation of Heterozostera from the genus Zostera. The tree based on matK supported the monophyly of the subgenus Zostera, and showed that Zosteraceae consist of three main groups: Phyllospadix, which is clearly defined by being dioecious; the subgenus Zosterella and Heterozostera; and the subgenus Zostera. Character-state reconstruction of chromosome number and geographic distribution for our molecular phylogenetic tree showed that 2n=12 is a plesiomorphic character for Zostera and Heterozostera, that the chromosome number was doubled or tripled in two lineages, and that the initial speciation of Zostera and Heterozostera occurred in the Northern Hemisphere. The matK tree showed the close affinity of Z. noltii and Z. japonica, which have disjunct distributions. Zostera marina, which is the only widely distributed species in the subgenus Zostera, also occurring in the northern Atlantic, was shown to be embedded within other subgenus Zostera species. 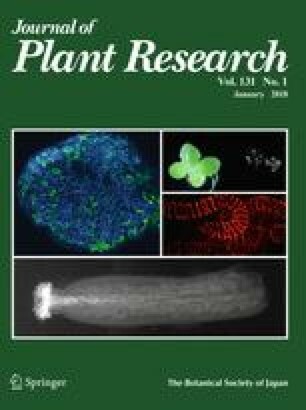 The authors thank Jin Murata for helpful comments on the manuscript, and Koichi Morita, Jun Michimata, Spencer Wood, Seiichi Tamura, Naho Miyamoto and Masako Watanabe for collecting plant materials. Financial support for this study was provided in part by the Salt Science Research Foundation, Japan.